John Ray, one of England’s greatest 17th century natural theologians, spent much time pondering the meaning of fossils or “formed stones” as they were called then. I have shared some of his thoughts about fossils and Earth’s history before (See: John Ray on Flood Geology: Words that Still Apply Today). In a correspondence with Mr. Edward Lhwyd on April 8 1695, John Ray shares some of his feelings about the new global flood controversies and interpretations of the Genesis flood narrative of his day. Thus his writing help to inform us about the roots of modern young earth creationist movement. The quote below is from a publication of Ray’s letters (Further Correspondence of John Ray) edited by Robert W. T. Gunther and printed for the Ray Society in 1928. The old English of Ray is difficult to read but I will interpret some of his thoughts below. I would gladly see Mr. Beaumont’s Hypothesis of wch he gives us a hint in his confutation of Dr. Burnet’s Theory of the earth p. 30, where he tells us, that he is of opinion that there is no mountain on ye earth now, that is an original mountain, or that existed when ye World first rose, & concludes with Aristotle that ye Sea & land have changed places, & continue to doe; & that he thinks it not possible for any man, fairly to solve ye Phaenomenon of marine bodies found in mountains, by any other Principle. You see he also proves his Hypothesis by bringing us to an Impossibility of solving the Phaenomena in an other way; and yet Dr. Woodw[ar]d hath invented another. It were not difficult matter, I believe, to furnish him with argum[en]ts more than he could readily answer agst his Hypothesis of Antediluvian plants, raised from those impressions upon Cole-slate resembling the leaves of plants; but I am not sufficiently qualified for such a task, as having never seen the varieties of them, nor the places where they are found, & their other Accidents. Your Argumt would be valid against him, were the world we render prevailed to be understood of increaseing’: but expositors understand it only of continuing upon ye Earth without abatement so long; wch makes rather for his Hypothesis. But the other particular concerning the unnecessarinesse of continuing the rain upon ye Earth to 40 days if ye World were dissolved in lesse than half that time holds good. But he commits another mistake in ye time of ye commencing of the Floud, wch he supposes to be in ye Spring, whereas it was, according to ye best expositors, in ye Autumne. For Tigri wch answers to our September was accounted the first moneth of ye civil year, so ye 2d moneth answered to our 8ber. True for indeed the Ecclesiasticall year began in March, of wch beginning the deliverance out of Egypt was ye occasion. (This being not the old beginning disused in Egypt, & taken up again, as he would have it.) Not withstanding wch ye civil year began as of old it did in September. One or two things let me ask you , whether the impressions be all of leaves or parts of leaves smooth & extended, or crumpled & folded up. For if they be all extended & smooth without any folds, plaits or wrinkles it is an unanswerable proof that they never were the impressions of Plants., And seeing the leaves of every plant have two different superficies, whether the two contiguous laminae of slate, between wch such leafes of Plants are supposed to have layn, have two different impressions, one of ye superior, the other of ye inferior surface of ye leaf. That the leaves, at least many of them, are of Plants not now to be found either wild or cultivated with us, you tell us in your Additions to Flintshire: where also you take notice of this work we are discoursing of, & give a favourable character of its Author. He references the problem of “marine bodies” (i.e. fossil shells) on the tops of mountains. As soon as it become popular to believe that fossils really represented formerly living things it was immediately recognized that marine fossils on mountains was a problem. That problem was solved in two ways: either the “Floud” covered the highest mountain which was what Woodward, the father of flood geology claimed; or there were no mountains before the Flood and the mountains were pushed up following the Flood. Today’s modern global flood advocates (young-earthers) have taken Burnett’s side that there were no high mountains before the Flood. Ray’s comment that “if they be all extended & smooth …. is an unanswerable proof that they never were the impressions of plants” refers to the continuing discussion that Ray maintains with Lhwyd about the nature of fossils. Lhwyd, as did many others of his day, believed that fossils represented natural shaped stones that mimicked many feature of living things but did not represent the remains of formerly living things. Here Ray is pointing out to Lhwyd that if all of the leaf shapes that Lhwyd is reporting to have seen are all perfect in their nature including not showing a top or bottom (“two superficies”) then they could not really be the impressions of plants. To Ray, if there were signs of different sides and if these rock leaves looked torn, folded, had insect damage etc.. then they should be considered the remnants of real leaves that were deposited in a “natural” way. 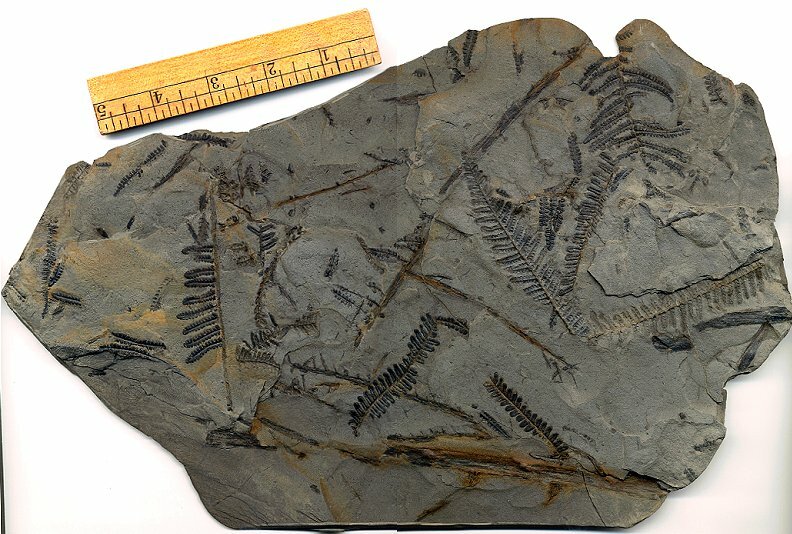 The picture to the right shows a number of fossil fern leaves (fronds). Most of the fronds are right side up but there is on the right side that is shows the bottom side up. Also, many of the fronds have damage or are folded over. 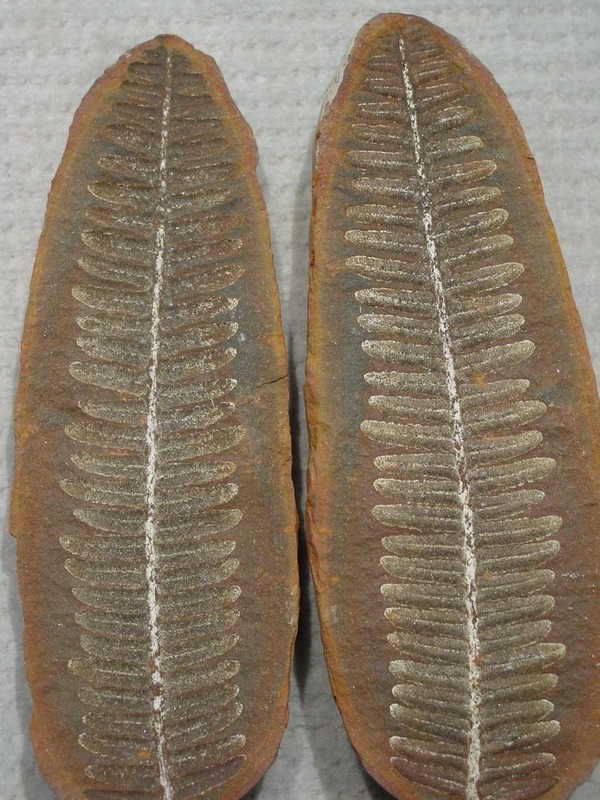 The picture at the top is a fern fossil from a nodule split into two-part, Ray and others discussed fossils that had this appearance as evidence that they represented the remains of real leaves. Others had argued that the symmetry and etched appearance of these fossils were due to saltations which they (including Lhwyd himself) likened to the growth of ice crystals on a glass plane. The fractal appearance suggested the possibility of an inorganic origin. Ray’s discussion about the time of year in which the Flood came upon the earth likely will strike modern readers as strange but the interpretation of Genesis at this time included much speculation about the specific time of year and even date when creation, fall, and the Flood took place. Today, YECs are fixated on details of the Noah’s Ark, how intelligent the pre-flood peoples might have been etc…. When I read the literature of the past I wonder how many of the creationist’s speculations today that seem so important to them now will become inconsequential questions to future generations. Lastly, Ray eludes to the very touchy subject of extinction. Some of the leaves observed as fossils couldn’t be assigned to any plants known to be living at the time. Ray had also noted differences in other fossils to those we see today. However the idea that any animal or plant could have gone extinct was near heresy. Extinction seemed to fly in the face of a Creator having made and cared for all of the plants and animals. The usual way to explain these fossils – for those that even accepted them as fossils – was to suggest that these living representatives of these fossils simply had not yet been observed. After all, there were so many places on earth that had yet to be explored. The fossils might only represent local extinction. Not long after Ray this explanation would become far less convenient as the world was explored and it became more and more apparent that most of the fauna and flora in the fossil record does not have a living member. When Mary Anning described the great sea reptiles (see: Mary Anning: Pleiososaurs, pterosaurs and the Age of the Reptiles) from the rocks along the shores of England extinction could no longer be denied. By that time, scriptural geologists as they had become known had already laid the groundwork for accepting extinction. The Great Flood as condemnation of man could be used to explain the extinction of many kinds of living things. However, land animals were excluded as they were preserved on Noah’s Ark but they – e.g. dinosaurs – soon met their demise in the post-flood world.